This is the highest quality SPDIF digital audio cable, made by Siltech in Netherlands It is in full working order, and good used condition. The most important feature of this cable is the use of the real and very high purity silver/gold wires made by very precise and special casting process. 2 coppie di cavi per casse acustiche. 2 Stück (1 Stereoset) Audiophil Legato Interconnect RCA Signalkabel zu verkaufen. Basierend auf bestem Siltech Kabel, Länge ca. 75 cm. Mit sehr hochwertigen WBT nextgen 0110 AgAu Anschlüssen.Voll funktionsfähig, optischer Zustand wie auf den Bildern zu sehen. Durch die Verwendung von hochreinem SILTECH G7 Silber/Gold-Material für die Signalübertragung und in Verbindung mit einem Hightech-Dielektrikum wird ein Höchstmaß anLangzeitstabilität und Wertbeständigkeit erreicht. Fabriqué avec des câbles de la réputé technologie G5 (Génération 5 en argent et or massif) de SILTECH CABLES. made of the G5 Technology of SILTECH CABLES. original SILTECH cable, made in Holland. Siltech spo-18m. no male mains plug fitted. This is a custom length 36" pair of Siltech FTM4 audio cables. The FTM4 was designed and voiced for Jadis gear, but I have found them to be one of Siltech's best sounding cables. You can see the stranded silver cable that is the HOT lead and that is what makes this an FTM4. I know the history of this cable since its manufacture. This is a custom length 30" Siltech SQ88. This cable has a bit of a story. If you look closely, you'll see the cable has SQ110 markings on the cable heatshrink ends. However, I want to be clear this is an SQ88 Classic G3. One pair of Siltech FTM-3 G3 interconnects in a very good condition. 0.5 mtr pair Siltech ST-18 G3 rca interconnects. The cable is build up with G3 silver-gold strands. Am 20.11.16 hat der Verkäufer die folgenden Angaben hinzugefügt. 0.5 mtr pair Siltech SQ-88 classic G5 XLR interconnects. Am 20.11.16 hat der Verkäufer die folgenden Angaben hinzugefügt. One pair of Siltech FTM-4 GOLD G3 interconnects in a very good condition. One Siltech Golden Ridge G6 Signature digital interconnect cable in a very good condition. The original box is included. Serial number is SG00616963. One pair of Siltech SQ-28 G5 Classic Mk2 interconnects in a very good condition. The original box is included. One Siltech Golden Ridge G5 Signature digital interconnect cable in a very good condition. The original box and certificate are included. Serial number is SG00610045. One pair of Siltech G7 Zero Ohm Link Diamond add-on interconnects in a fantastic condition. The original box and certificate are included. Serial number are SCA2503368 and SCA2503369. SILTECH SQ-88 Classic G5 Mk2 Analog Interconnect Cable 1.0m XLR. Siltech SQ-80B G3, 0.5m XLR - pair. Siltech Classic Anniversary HF. BNC-BNC connectors. So read carefully. I will assist every way I can to get your money back. When an item is listed "as is" I do our best to describe the item, but cannot be held responsible for any issues with the item due to age or condition. SILTECH 770i RCA 0,75m (PAIR) NEW! 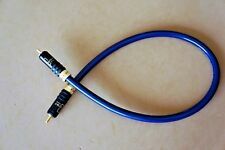 SILTECH 770i RCA 0,75m. Manufacturer SILTECH (The Netherlands). Connector type RCA - RCA (SC006). 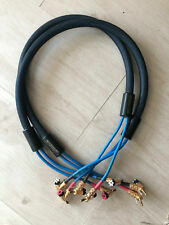 Device type RCA interconnect cable. When an item is listed "as is" I do our best to describe the item, but cannot be held responsible for any issues with the item due to age or condition. SILTECH DC6.3M HD800 headphone cable 2.5m. For Sennheiser HD800 Headphone. A box and certificate of authenticity are available. The cable is in the room without pets and non-smokers. Cable, box, certificate - everything is in excellent condition. Item corresponds to the photo 100%. 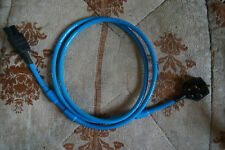 ORIGINAL.Power Cable Siltech Ruby Mountain II G7 1.0м. Connectos furutech FI-50 (R),furutech FI-E50 (R). A box and a certificate of the authenticity of the cable are enclosed. The cable was in a room in which there were no pets and smoke from cigarettes. T hat's an excellent combination together with this amazing cable. One of the best things that you can get! ZERO OHM LINK. When an item is listed "as is" I do our best to describe the item, but cannot be held responsible for any issues with the item due to age or condition. So read carefully. I will assist every way I can to get your money back. One of the best things that you can get! With original box and sertificate. Siltech Signature Cable Box Only, no cable! Application : Power cable. Core netal : 11 cores sliver-plated. Trade item condition.